Water is our most essential resource — a resource that belongs to us all. But there are far too many people around the world who do not have access to clean, safe water: a basic human right. One in four people do not have access to enough safe, clean water to drink, cook, and bathe. In fact, more people die from unsafe water than from all forms of violence, including war. And water systems around the world — including in the U.S. — are failing or are in danger of failing because of a lack of critically needed investment. This water crisis is only deepened by the actions of transnational water corporations that exploit the global crisis to gain control of and commodify water. 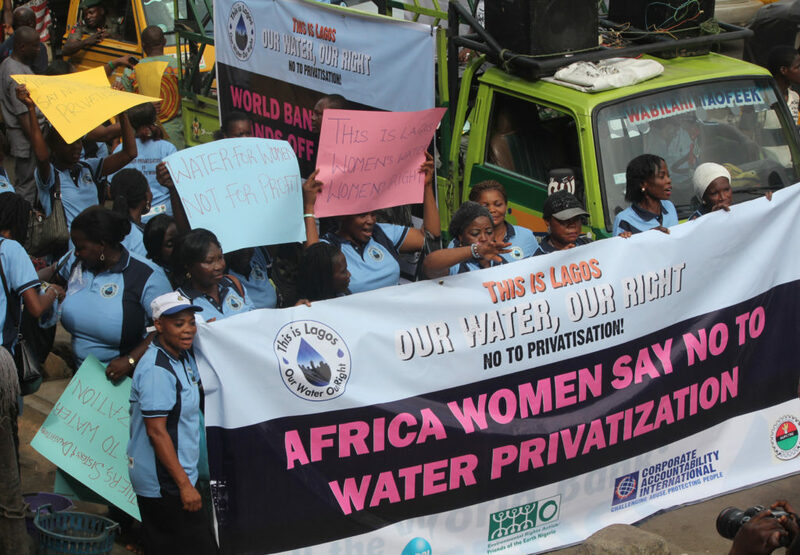 Women in Lagos demand a strong, public water system. Photo credit: Environmental Rights Action, Nigeria. But tap water isn’t the only enemy for corporations like Nestlé. Public control of water resources also limits their quest for massive profits. So for decades, Nestlé has attempted to take control of the water resources of low-income, rural communities from Pennsylvania to Michigan to California to pump out local water for pennies on the gallon. And when public water crises like those in Flint and Detroit hit, the bottled water industry jumps in and positions itself as a solution. Capitalizing on the groundwork laid by the bottled water industry, water profiteers like Veolia and Suez are attempting to control public water systems. In doing so, they put private profits first, putting people’s health and lives at risk. How? To ensure profits, corporations raise water rates, shut off service for those who cannot pay, engage in labor abuses, neglect infrastructure, and apply shortcuts that can jeopardize water safety. We see examples of this around the world: Pittsburgh, Pennsylvania; Manila, Philippines; and Nagpur, India to name just a few. But this global water crisis does not affect all communities equally. In the U.S., our racist and exploitative economic systems result in communities of color and low-income communities being disproportionately impacted by water shut-offs, high water rates, and contaminated water. And across the Global South, transnational corporations and their financial backers like the World Bank attempt to push water privatization on communities. Building on deadly legacies of imperialism and colonialism, these entities threaten the right of communities around the world to control their own water. For example, the World Bank is increasingly sinking its funding directly into support for the private sector. It is even investing directly in water corporations. These actions are bearing results that directly contradict the World Bank’s stated mission to end extreme poverty and promote shared prosperity. 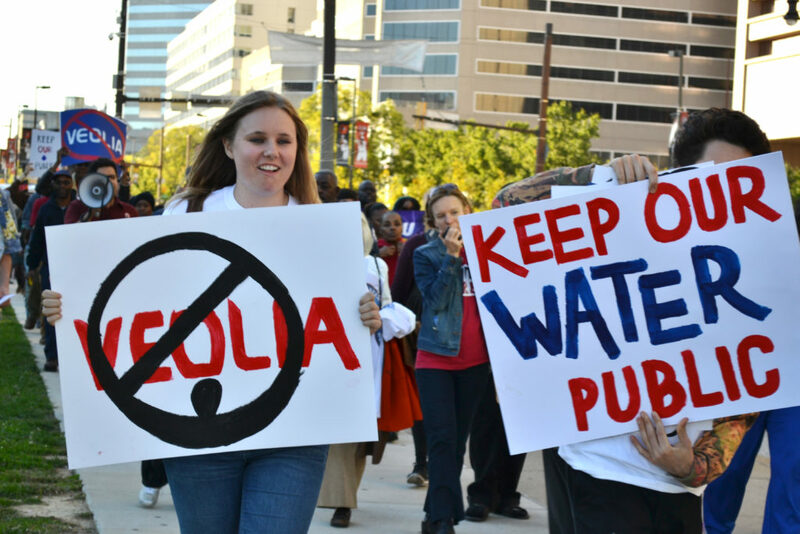 We partnered with organizers in Baltimore to stop a contract with water privatizer Veolia. Over the past two centuries, the public water systems in the U.S. have been vital to vastly improving public health, growing the economy, and creating jobs. When water systems are democratically controlled and adequately funded, we see near universal access. This is true in both the U.S. and around the world. Indeed, public water systems have been the cornerstones for public health and economic prosperity globally. And it’s not a pipe dream to imagine this vital public service available to everyone. There is enough water to meet the basic needs of everyone on the planet. In fact, every person in the world could have access to clean, safe water and adequate sanitation by 2025 for an additional annual investment of about $90 billion. Compare that to the $1.78 trillion in global military spending every year! We must address the real scarcity: the lack of political will to ensure democratically controlled, publicly accountable, and publicly funded systems. Put the needs of people over any corporate bottom line. Protect water as a common good. Advance the human right to water. 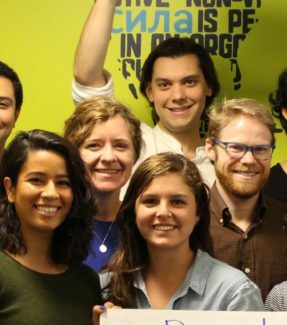 Corporate Accountability and our partners are a formidable force in the global water justice movement. Together, we are gaining tremendous ground in advancing the human right to water. Moving six states and 140 cities to promote public water and/or go bottled water free. Mobilizing with communities like Wacissa, Florida to prevent Nestlé from bottling water from their pristine water sources. 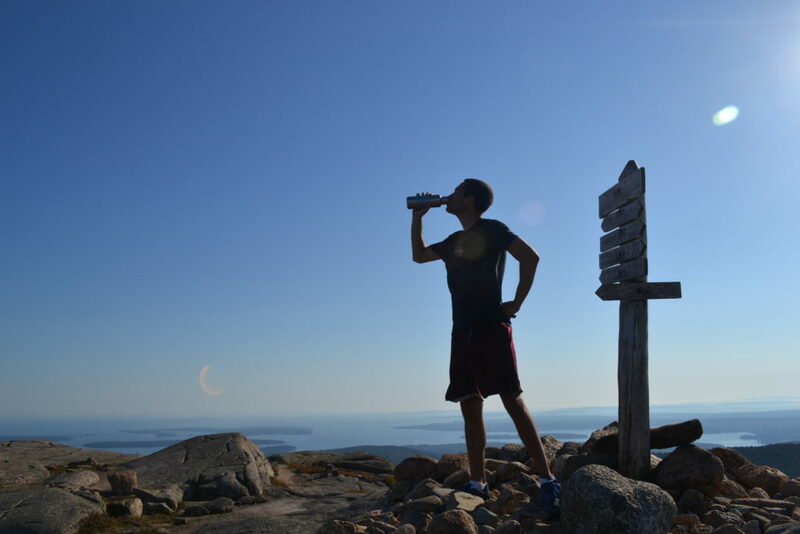 Sparking a movement among U.S. national parks to give bottled water the boot. In 2017, 164 reported taking steps to go bottled water free. And, when the Trump administration rescinded the National Park Service policy outlining how national parks can go bottled water free, more than ten thousand people like you took action to support their local parks. Together, we urged our parks to continue doing the right thing for the environment and water justice. Together we’ve built a national movement for bottled-water-free parks. Defeating state-level legislation that threatened public water in Wisconsin and Massachusetts. Preventing one of the biggest water profiteers, Veolia, from getting a foothold in St. Louis and Baltimore. Preventing the privatization of water systems in Lagos, Nigeria. 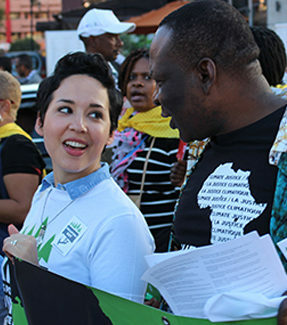 Since 2015, we have been closely partnering with longtime allies at Environmental Rights Action/Friends of the Earth, Nigeria (ERA) to challenge water privatization. Together, we are waging a robust international campaign to advance the human right to water in Lagos and advocate for fully public solutions. Currently, we are organizing in Pittsburgh to hold Veolia accountable for its role in the city’s lead crisis. Join us! Take action here. Forcing the World Bank to divest from Veolia, one of the world’s largest private water corporations. Keeping at bay a plan to privatize the Lagos water system that the World Bank had been laying the groundwork for over the course of decades. In a major victory, we forced the World Bank to abandon its effort to secure a public-private partnership in the water system in Lagos as part of its ongoing loan in that country. Moving one of the most influential members of Congress when it comes to controlling the purse strings for the World Bank, Representative Gwen Moore, to take action. In 2016, she called out the World Bank’s harmful promotion of water privatization. She demanded the financial institution address its conflicts of interest in the water sector and “cease promoting and funding privatization of water resources” until it does so. 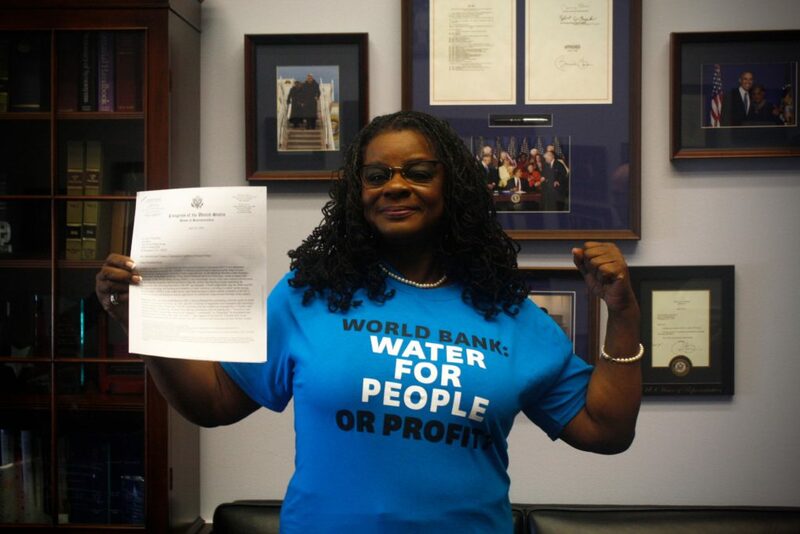 Rep. Gwen Moore challenges the World Bank on water privatization. Today we have a historic opportunity to protect human rights globally — including the human right to water. Governments are in early negotiations to develop a U.N. treaty that has the potential to protect human rights from corporate abuse and hold corporations accountable. When it comes to water, a strong treaty would advance access to water as a human right. That’s why Corporate Accountability is organizing to ensure this treaty is a powerful, lifesaving tool for justice. Learn more about the treaty — and how we can make it a powerful tool for justice. Corporate Accountability is forcing changes in the way the private water industry is allowed to operate—and advancing the human right to water around the world. 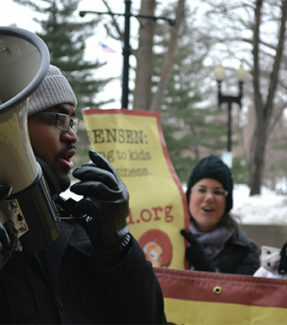 Members, activists, and allies are the driving force behind this campaign. In partnership with people like you, we will create a world where all people have enough safe water to meet their needs. And we will ensure access to water is prioritized for the public good—not dictated by the relentless drive for corporate profit. Together, we can realize a world where no life is lost for lack of something as fundamental as safe water. Get informed. Read up on the failures of water privatization. Stand in solidarity with people in Pittsburgh who are organizing for a just resolution to the lead crisis. Take action to demand an investigation into water privatizer Veolia’s role in the crisis. Sign the petition to urge Congress to oppose Trump’s plan to privatize our infrastructure.